Castleford Tigers are focusing on their own game rather than worrying about what is happening with Sunday’s opponents Leeds Rhinos, according to head coach Daryl Powell (writes Tony Harber). The Rhinos sacked their head coach, Brian McDermott, on Monday following a run of seven straight Super League defeats, but the Castleford boss believes his team should not change their approach to the derby game ahead. “I think it’s a bit of an unknown when you lose a coach and it will be interesting one. I don’t know if it makes it harder for us,” Powell told the Express. “It will be interesting to see how they play, but having watched us last week I think we’ve got a bit to worry about ourselves without worrying about Leeds. “So we will just focus on ourselves and play as well as we can. 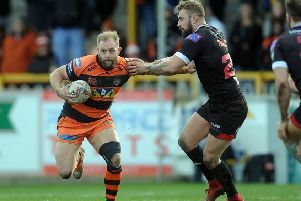 Castleford have beaten the Rhinos twice already this season and are unbeaten in league games against them since 2015, but Powell does not believe past results will have a bearing on Sunday’s game. “We know how to beat Leeds, but on any day they’ve been very close to us and they obviously beat us in the Grand Final,” said Powell. Powell accepted his team had been poor at Catalans and refused to use the heat as an excuse for the performance. He said: “You have to have a tough attitude and our attitude wasn’t where it has been in recent weeks. I think everything was down on our usual standards. You make errors and it puts pressure on your defence. “But we were a little bit leaky, there was some soft efforts for some of their tries. “When one player just carries it on his own and scores you know there’s not a toughness and resilience to your defence and that was us so it was not good. Powell added: “I wouldn’t make any excuses, but we still had nine players missing and when that happens you’ve got to be really good. “We’ve done some really outstanding things over the last month, but this game just wasn’t one of those days for us. There are times you just can’t go that extra step. We didn’t really compete in any department.